Bring out your child's inner artist on a huge outdoor canvas that gives them creative freedom to roam. It's a fun project that keeps the kids busy and gives you time to sit back and watch. 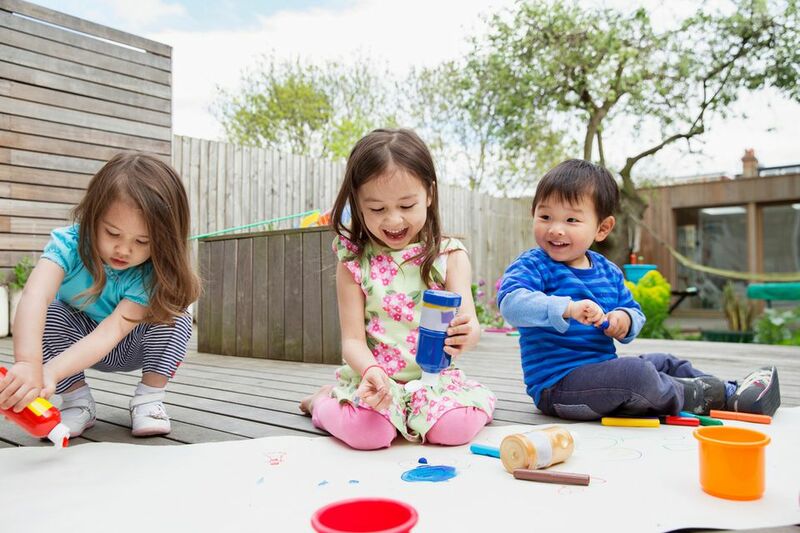 These creative outdoor painting ideas will have your kids soaking up the fun while creating a masterpiece. This outdoor painting project easily adapts to your needs. For one child, you can make the canvas shorter. For more than one child, make the canvas longer. It's ideal for play dates because moms can sit and chat close by while the kids paint together to create a work of art. This project is perfect for kids two and up. Setup requires cutting with scissors, taping or pinning the banner in place and pouring the paints. Once an adult gets everything ready, children can finish the project on their own. The best part about the supplies list is that once you buy these products, you'll have plenty of supplies left for future projects. The kids will want to create new paintings over and over again, and you won't have to continue spending more money on the supplies. Use creative ways to find coupons to knock down your project costs. Washable tempera paint comes off of clothes and skin easily. Old clothes are recommended to be safe. Substitute the bowls for old baby bottles. 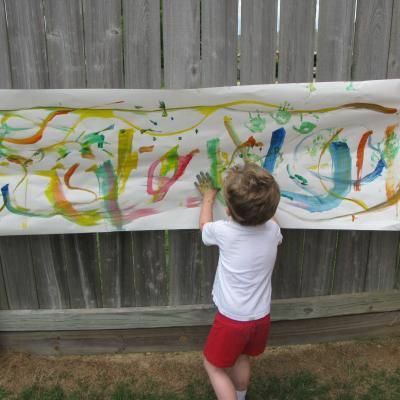 Unroll the banner paper to the length you want your child's art canvas to be. The 24" banner paper will give them a 2-foot tall area to paint. How long you want the banner to be is completely up to you. We went big with our banner at 10 feet long. Leaving the banner in place on the ground, trim the banner paper near the roll. Your line doesn't have to be straight, so you can eyeball it. Tape or pin your banner paper in place. Wooden fence posts are used here. If you don't have any place to attach your banner upright, you can always keep it flat on the ground or in the driveway. The long canvas attracts a child's attention no matter how it's placed. Your canvas should be securely in place and ready to go. For younger artists, make sure they're tall enough to paint comfortably without having to reach too high. Adjust one side at a time if the canvas is crooked or needs to be lowered for smaller children. The banner paper is large and heavy and the longer your banner, the slower you'll need to go when moving it. Use your bowls or old baby bottles for the paint. Pour out the colors all at once to give the kids a beautiful palette to work with. Use a small table for your paints or put the bowls on the ground. The table was covered in paint by the end of the project. But the washable tempera paints came right off with a quick spray from the garden hose. Place your brushes on the table, if you have one. Or put them on a piece of cardboard or another hard surface to protect them from picking up dirt and gravel when they're not being used. Rinse the brushes in a cup of water in between colors. Now's the time adults can step back and let the kids play. Or you can get right in there and paint with them too. The large canvas keeps them busy. We spent two hours on our masterpiece. There are no rules when it comes to how the kids paint. As you can see here, we played with splattering, painted a picture of mom, used regular brush strokes and ended with handprints all across our 2-foot tall, 10-foot wide canvas. Get as creative as you want and try new techniques, such as sponge painting or using unique paintbrushes. Preschoolers will be more than happy to drench their fingers in the non-toxic tempera paint. Let them finger paint. Just be ready for the mess. This is another reason the washable tempera paints come in handy. We ended up with paint in our hair, on our clothes, and on our skin. The paint came off the clothes in one wash, and there were no traces of paint on us after a bath. Is the artist really finished with the painting? You can leave the banner in place for several days to make this a daily art project the kids can continue to paint throughout the week. Once you get past the initial cutting and tacking up the banner, your work is done. So keep the canvas on its makeshift easel as long as you want and put your feet up in a chair while you watch the kids paint you a masterpiece. Rainy day? Bring your giant canvas indoors. You'll have to limit the paint and maybe opt for crayons or markers but you can still have the same fun inside.